One of the reasons why laser surgery cannot be performed is that the cornea is too thin. The eye is like a ball which must be sufficiently thick and strong to maintain its round shape. Laser surgery makes the cornea thinner. The general opinion of eye doctors is that in the interests of safety, after LASIK surgery there must be at least 250 microns of untouched tissue and after surface surgery (PRK, ASA), at least 350 microns. ReFocus Eye Clinic uses a standard that is 50 microns wider and, for example, we always plan the femtoLASIK procedure so that at least 300 microns remain intact. This thickness can be widened due to the fact that the femtolaser flap is up to 50 microns (or 10% of the total cornea) thinner than the flap cut with the microkeratome used in LASIK surgery. Third-generation SMILE laser surgery (Small Incision Lenticule Extraction) is a game changer from both the corneal thickness and strength perspectives. The SMILE method removes deeper layers of corneal tissue, so that the superficial layers remain intact. The cornea is composed of superimposed layers and these are strongest in the anterior cornea. Studies have found that the anterior 40% of the cornea is at least twice as strong as the posterior 60%. SMILE surgery preserves the stronger anterior layers, unlike the LASIK or ASA procedures. 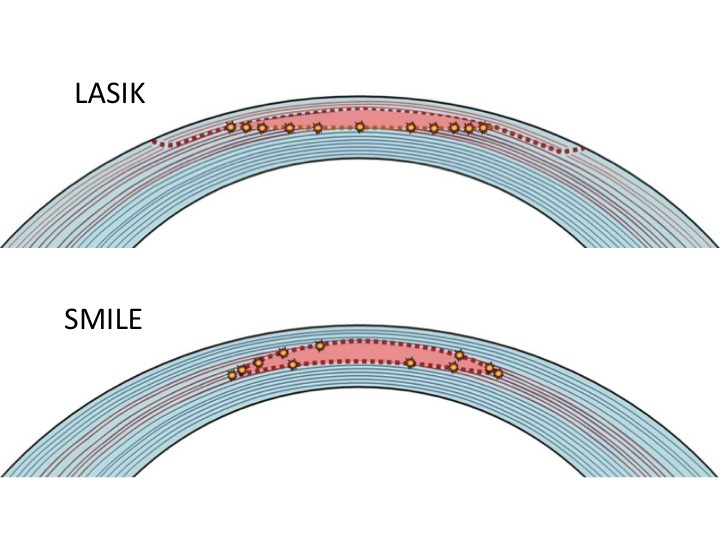 According to the mathematical model, with a corneal thickness of 550 microns while maintaining 60% of the strength of the cornea, it is possible to correct about 6 dioptres of minus glasses with the LASIK method, 10 with PRK and 13.5 with SMILE. Thus, we can more safely operate on patients with thinner corneas with the SMILE procedure, compared with the previous methods. In conclusion, regardless of the thickness of the cornea, the risk of corneal shape change is lower with SMILE.